Anchaviyo Resort is an eco-friendly luxury property, located on the banks of the Vaitarna River in the Palghar district. If you're looking to escape from hectic city life, this is exactly where you should go! Anchaviyo is close to the town of Wada, and about a 5.5 hour drive from Pune. Nestled in the lap of nature, this resort has accommodation in the form of igloos (built for two), chalets (tree house, beehive, and bird's nests), mud houses (built by a talented local Warli tribe family), themed log cabins, and large air-conditioned tents. We think they'd made an ideal destination for a romantic getaway, a solo trip, or even a family vacation. This well-kept secret is an oasis in itself, and you'll find plenty of mango, chikoo, guava, and cinnamon trees throughout the property as well as a rice field, and a sugarcane plantation. We love that Anchaviyo uses eco-friendly transportation in the form of e-rickshaws as well as e-cycles, practices organic farming, composting, recycling, and even uses solar power! 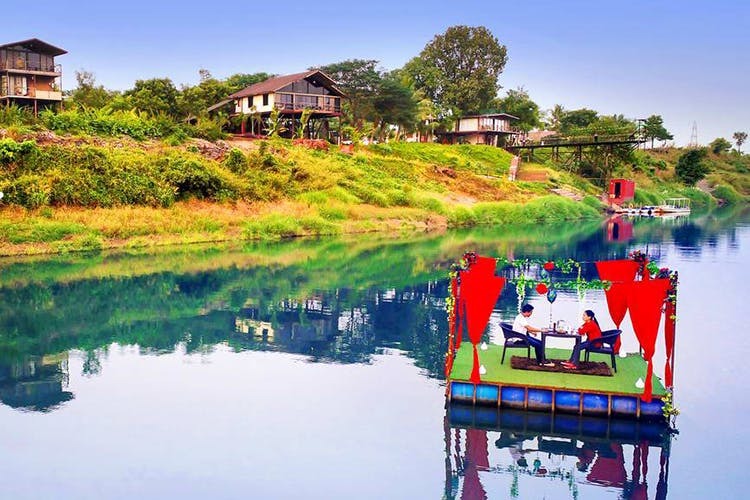 The resort's on-site restaurant serves multi-cuisine organic vegetarian food sourced from the estate itself, and offers a panoramic view of the riverfront. If you'd like a more private dining set-up, that can be arranged for in their Balinese-style gazebo, or under twinkly lights on a floating river deck - at prior request. For more adventurous folk, the outdoor activities here include football, cricket, cycling, kayaking, swimming (in the resort's own pool), and ATV riding. Fans of the indoors can partake in foosball, table tennis, pool, chess, or even PS. Most of all - remember to drink in the natural beauty of the resort! Prices are a bit steep - but then again, this isn't your average resort. River-based activities are not available during the monsoon season, but we're told they resume come October. For customised requests like private dining, you'll need to notify the resort in advance.